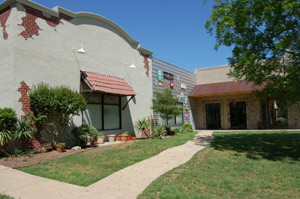 The Southern Cross is a family-owned and operated Ranch that has served the Dallas area since the year 2000. Its owners, Brad and Judy Lee, had been in the entertainment business since 1986, when they purchased the oldest entertainment agency in the state of Texas, Joan Frank Productions. Several years later, they added an Event Planning company, Corporate Recreation Services, and began hosting events at facilities throughout the Dallas/Fort Worth area venturing as far west as San Francisco and Orlando to the southeast. Their experiences at various venues taught them which particular features were best suited to meet their clients' needs. In 1997, the Lees took a leap of faith and purchased a building that was scheduled for demolition, and the seeds of The Southern Cross were planted. The building was dismantled and stored while the owners set out to find a suitable location for the Ranch. Approximately one year later they stumbled upon forty heavily wooded, overgrown acres on Dowdy Ferry Road in South Dallas, and the seeds took root. Located minutes from downtown Dallas, the land seemed ideal for their needs. Next came the tedious and frustrating process of wading through re-zoning issues, building permits and city ordinances, as well as the actual design of the facility. Every attempt was made to incorporate the best features of host facilities they had visited in the past as Event Planners. After several setbacks and seemingly insurmountable roadblocks, The Southern Cross finally opened for business in January of 2000. Devoted Environmentalists and Naturalists, the Lees made every effort during construction to keep the land in its natural state wherever possible, and they continue to support causes to that end. Judy is a Wildlife Rehabilitator, and in 2005 the Lees received an award from the International Wildlife Rehabilitation Council for their service. At a recent IWRC symposium, both were certified by the Texas Parks and Wildlife Department "to educate the youth of Texas about conservation, wildlife, the environment and responsible human action" through Project WILD. If you would like to join our team, please download and complete this application. You can mail or fax your application, or contact us for opportunities to meet with us.